Momofuku Milk Bar is a chain of dessert shops that has locations all over New York City and Toronto. They sell all different types of cookies, pies, ice cream, and drinks that come in unique and quirky flavours. I visited the Midtown locations while on vacation in New York. This location is really tiny and it just consists of a takeout counter outside of Ma Pêche (another restaurant that is a part of the Momofuku chain). It is in a convenient location if you want a snack after doing some shopping. One of the things Momofuku is famous for is their cereal milk creations. The cereal milk is made with cornflakes soaked in milk to get a slightly sweet flavour to it. You can buy bottles of the milk or enjoy it as soft serve. I tried the soft serve cereal milk ice cream and I paid an extra 50 cents to add cornflakes on top. The ice cream was surprisingly tasty and it had a unique flavour. It was rather mild and very creamy and it had a subtle sweetness and “corny” flavour. Adding the cornflakes is a must-do as they added a really nice contrasting crunchy texture and salty flavour. If you like trying new things this ice cream is definitely worth trying. 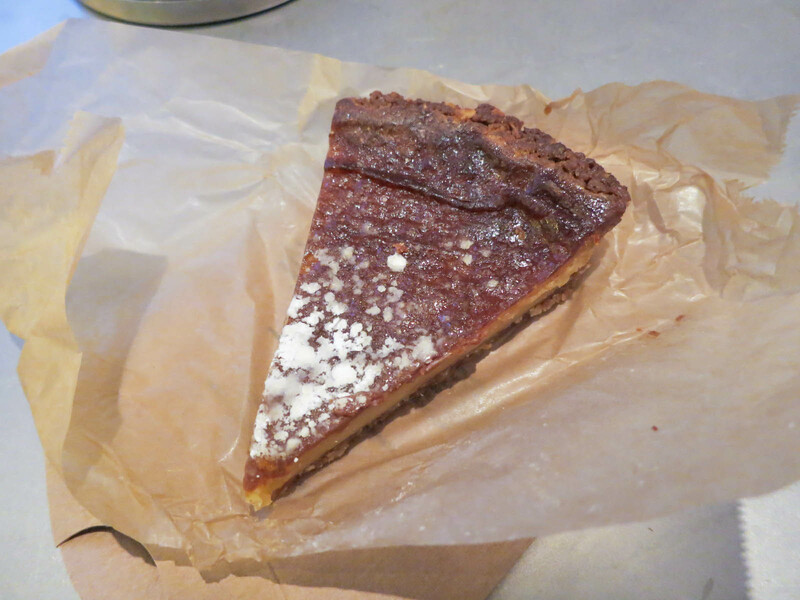 The crack pie is another one of Momofuku’s signature desserts. I can see how it got the name because it is very delicious. It reminded me a lot of the filling of a butter tart as it had a sweet, rich, brown sugar flavour. The crust was crisp, dense, and buttery and it held together the soft filling well. If you have a sweet tooth, you will definitely love this pie. This Milk Bar location also sells the momofuku pork buns, which is a good way to try one of their signature dishes without having to eat a full meal at the restaurant. The pork belly bun was everything i hoped it would be. The meat was super fatty and tender and cut into two thick slabs. The bun was also filled with sliced cucumber and a rich umami sauce. These are the perfect little snack and a nice savoury option to balance out all of the sweet desserts. 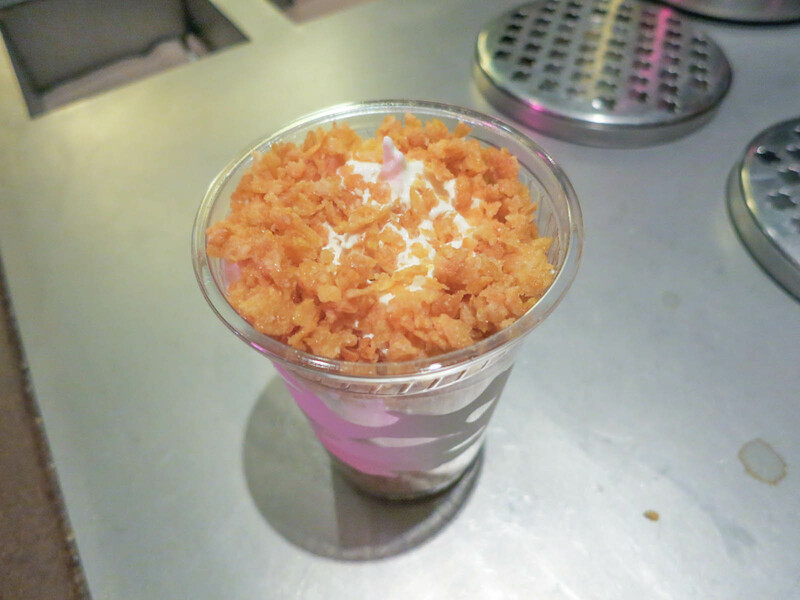 The treats from Momofuku Milk Bar are fun, creative, and tasty. There is a lot of hype surrounding this place, but I think it is a good place to check out, especially for a novelty/specialty dessert. I would also come back in a second for another take out order of the pork belly buns to avoid the lineups at the other restaurants. Yes, for fun treats and snacks. What did you think of their cookies? Does anyone do something similar in Vancouver to the pork bun? I’ve never had them in Vancouver 😦 I think Hapa Izakaya may have a similar appetizer though.